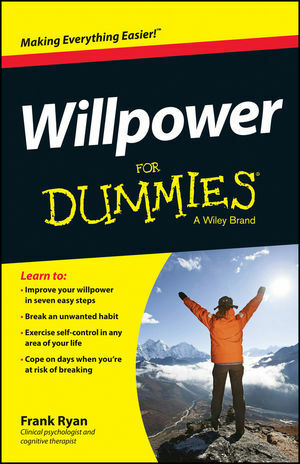 Willpower For Dummies shows you how to train, strengthen, and improve your willpower in seven easy steps! Written by a clinical psychologist and cognitive therapist, the book proves that willpower can be learned like any other skill, and provides tons of practical exercises and strategies you can start using today. You'll learn how willpower works inside the brain, and how choosing goals and identifying challenges can affect your success. The book stresses the importance of patience, rewards and being kind to yourself, and walks you through the techniques that will keep you on the right track, even on your worst days. The mind works in two different ways: the long view and the short view. Controlling which aspect wins out is the key to willpower. Willpower For Dummies breaks this complex science down into easily digestible bits, written in plain English with a dash of humour. You'll find scientifically robust guidance toward strengthening your willpower just like a muscle, and expert advice on training your brain to work with you instead of against you. Whether you're trying to lose weight, quit smoking or just work harder, rest assured that you can do it—regardless of past failures and false starts. Willpower is not a trait, but a skill. Everyone can learn it, and everyone can make it stronger. Willpower For Dummies walks you through the process, teaching you the skills you need for lasting success. Frank Ryan is a clinical psychologist and cognitive therapist, specialising in cognition and impulse control. He is also the author of Cognitive Therapy For Addiction, published by Wiley.